September 2016 through June 2017, our three cluster groups (north, central, and south) meet regularly. 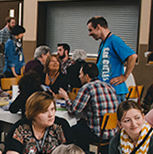 Participants are pastors, staff and leaders serving in parachurch ministries. The focus of our clusters is to provide a safe and open time for leaders to share their concerns, passions, and experience in areas of ministry with a view to empowering one another toward effective and fulfilling ministry. Peer Clusters meet together on the second week of most months, from 10:00am till noon. We are also planning some training sessions in the afternoons for leaders that would like to stay. Dates and training topics are listed below – locations TBA. If you want to be included in the Peer Cluster Group emails, please contact Ruthie at ruthie.kamphuis@abmb.ca.